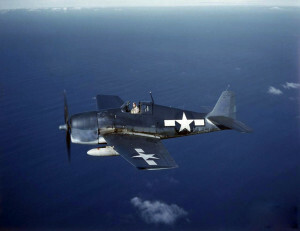 On the night of May 7, 1945, an Ensign was taxiing in an F6F-5N Hellcat, (Bu. No. 71572), along the runway at Charlestown Naval Air Station, and didn’t see another F6F-5N, (Bu. No. 71938), occupied by a Lieutenant Commander, that was parked on the runway. Both aircraft had their running lights on at the time. The Ensign’s aircraft collided with the one occupied by the Lieutenant Commander and both aircraft were damaged beyond repair. Fortunately, neither pilot was seriously injured.